Wow! 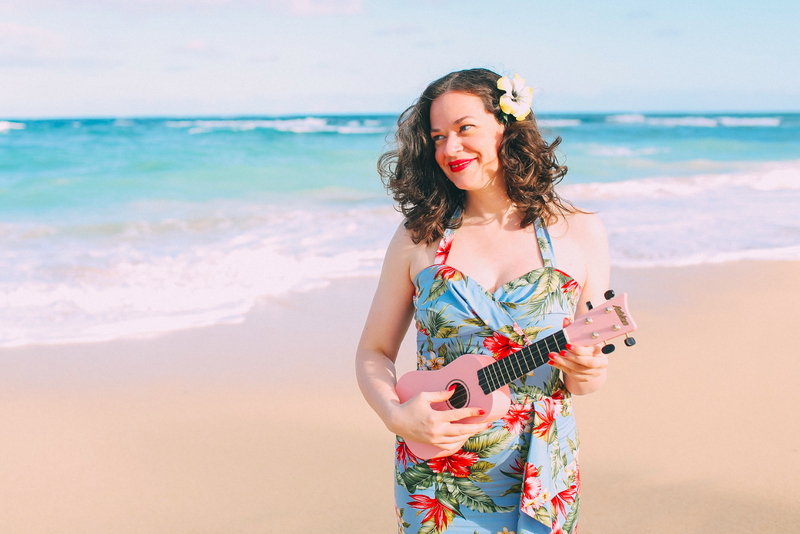 What a whirlwind week! I have a bit of catching up to do and the first thing I want to share is my dress that I finished last week. The challenge over at the Sew Weekly was fabric painting and/or dyeing. My inspiration this week was the song '99 luftballoons' by Nena. 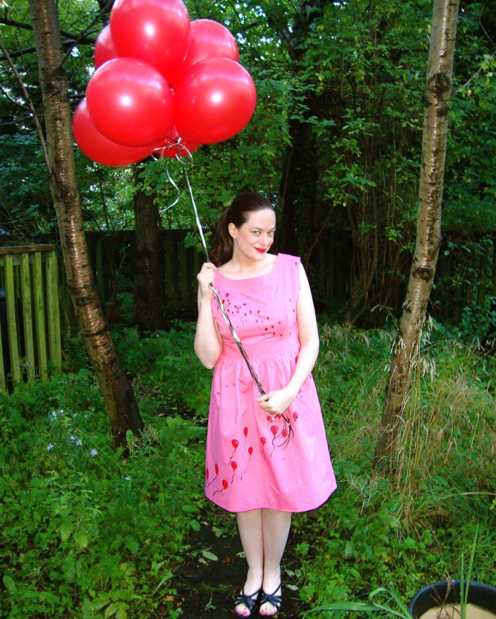 I wanted to recreate the red balloons floating across a dress. 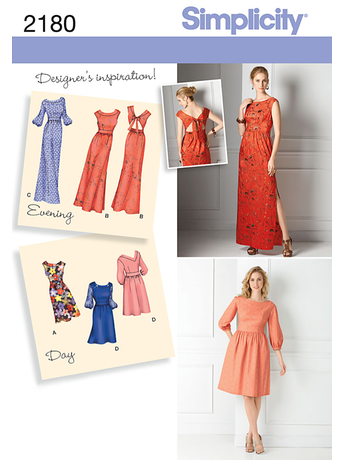 Once I had decided on this idea, I choose Simplicity 2180 as the dress pattern. I really loved View A which was a knee length sleeveless dress, gathered at the waist with a fabulous cut-out back which closed with tied bow. 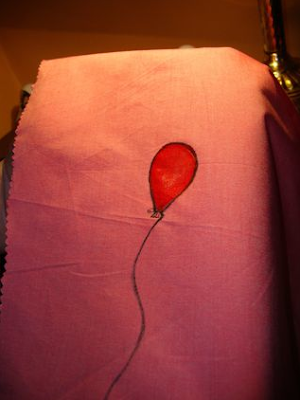 I made the dress out of 100% cotton material as I thought that would be the easiest to paint. Simplicity 2180 was fairly easy to put together, though it did take some time. I ended up not putting in the pockets but I followed all the other directions to a T! The directions were fairly clear except for the waistband facing--I found it a really bizarre way to put the dress together and it didn't become immediately clear until about 9 steps later. At that point I had the 'aha' moment and figured out the reason they were having me do things a certain way. Sometimes I wish they put little notes in the directions like the following..."I know this won't make sense...but trust me later when you attach the skirt to the bodice, having this bit the way it is will make it look all nice and pretty inside...." That's all I really need. Otherwise, my inclination to skip steps increases!! The nuts and bolts of the dress is that it is one bodice front piece with two darts and two bodice back pieces with an attached bow tie. Their method of constructing the bow tie is fabulous and worked really well. The bodice is attached to the skirt via a waist yoke (with aforementioned tricky waist yoke). Normally there would be pockets in the side seams but I was too impatient to put those in (seriously--there were 35 steps to constructing the dress and nearly 10 of them were for the pockets!!). 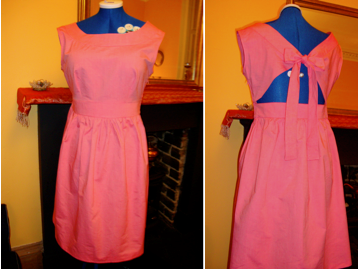 The dress is actually designed so that the shoulders sit almost 'off the shoulder'. I find this a bit annoying and keep wanting to pull my sleeves up to sit more on top of the shoulder. I think if I were to make this pattern again I would adjust it so that it sits more properly on top of the shoulder. I absolutely LOVE this dress! 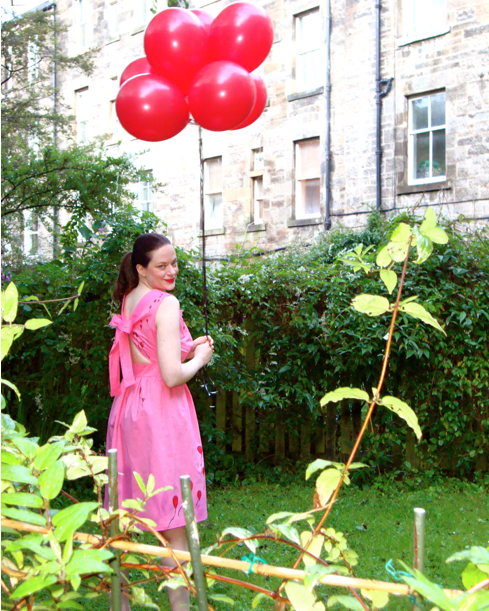 The balloons float up the dress and down the back! It's so fabulous. The black paint was a bit harder to work with than the red paint for some reason. The balloons start out larger on the bottom of the dress and gradually get smaller. We also decided to not paint the waistband or shoulder yokes. I really love how it turned out!!! YAY! I love it so much! What do you think? This is seriously cute. The placement of the balloons is perfect. What a fun dress! I seriously need to start getting some sewing skills. 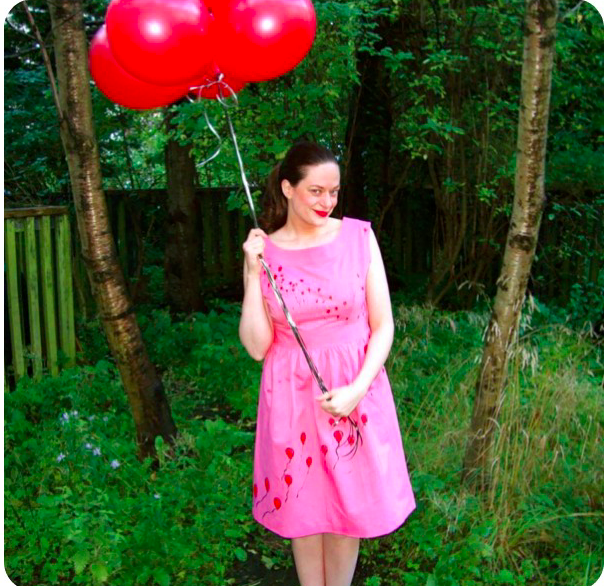 Beautiful dress and the photo shoot with the ballons? Pure genius!!! I love it! So cute! The bow at the back is a fantastic feature too :) I now have 99 balloons in my head, can't stop singing it...! supercool idea! What beautiful colours and a realy nice pattern! Love it! There's something about that dress that just makes me happy. So cute! You look like you are about to float up into the sky!! 99 Luft balloons is one of my all time favorite songs. This dress make me happy and I love the back! Oh, I love it so much - it´s such a pretty little thing! As others have mentioned, the placement of the balloons is just perfect! So pretty, the back-tie feature is gorgeous. I really love your hair like this too Debi! I love this dress. The balloons are a wonderful addition. BTW you look so pretty in pink. this is fabulous! I am also loving that you are sewing more than vintage as well. The red and pink combo is CUTE CUTE CUTE! Debi, I adore this dress. You did such a lovely job choosing a pattern to showcase the painted balloons. The back of the dress is my favorite part. How wonderful that you have an amazing husband that you can trust to do a perfect job when he helps you with your sewing projects. I love this dress. Love, love, LOVE! Oh this is so lovely, the back is great but the ballons really do make it! Amusing to look at, and probably to wear. I like that you confined the balloons to bodice and skirt. Looks much more purposeful that way. And that you painted on the back of the dress, too. One of my favorite childhood dresses had a little mouse painted onto the back of the dress -- I spent far too much class time in second grade twirling my skirt and twisting my head to try to see the mouse. I love it! Really great idea and it came out fabulous! So adorable. The idea, the execution, the whole thing is just genius! How cute is this? Love the whole idea. I think you should do a tutorial on this so all of us can copy YOU!!!! So amazingly cute! I love the idea and the execution! :) Well done. 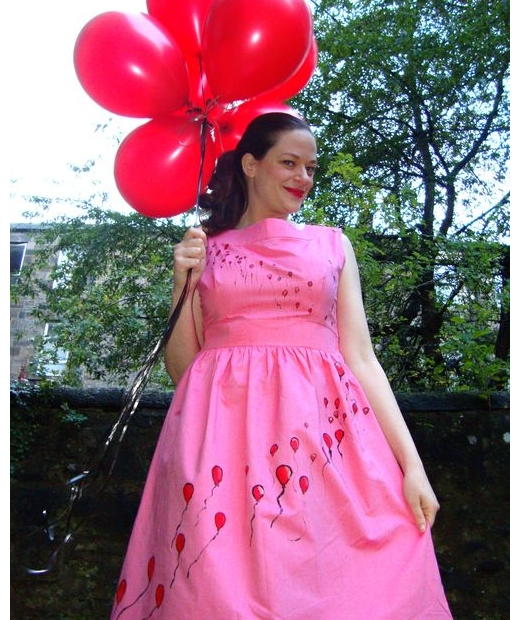 Oooh, what an eye catching dress - the balloons really do make it. What did you use to paint the balloons? I love the style, the colour, the balloons, it's perfect! This is possibly one of the cutest dresses I have seen! I love the way it all comes together so perfectly - bow, balloons, colour, everything. What a wonderful creation! You love it?? I LOVE IT TOO!! It looks fabulous and it is so cute how you and David collaborate on things. His ballons look amazing. I love the back detail too. This is ridiculously adorable! It could so easily have turned little girl, but it doesn't...just straight up whimsical & fun! And bravo to David, too! What a sweetie. That is such a cute dress- and a great colour on you. And those balloons- fabulous!